Radio Call Sign Address Plaque - - for all radio, television, and other FCC-licensed transmitters. Personalized address sign includes your call sign characters standing on the oval plaque's top edge. For indoor or outdoor use. Unique design made in USA exclusively for Comfort House. 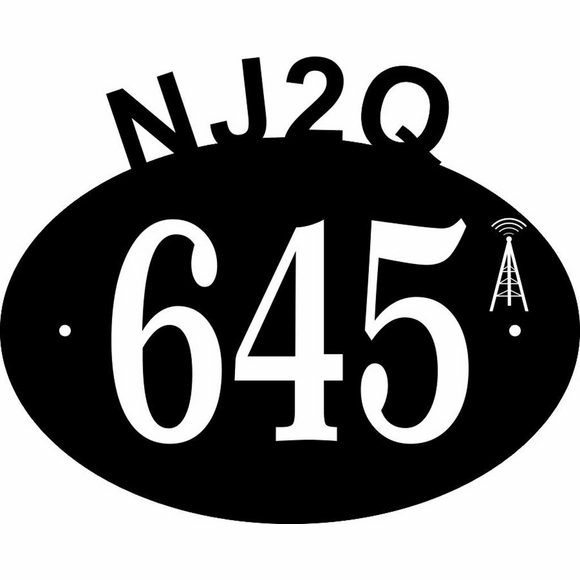 Perfect for ham radio operators (CQ CQ from NJ2Q). Personalized 9"W x 7.5"H acrylic house number sign consists of a 9" x 6" oval address plaque with small radio antenna accent plus your call sign in silhouette characters across the sign's top edge. Characters and accent are engraved into the surface, not painted, printed, or silk screened to the surface. Overall size: 9"W x 7.5"H x 1/8". Custom address plaque for ham radio buffs operators exclusively at Comfort House.